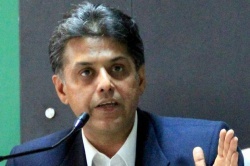 Union Information and Broadcasting Minister Manish Tewari Wednesday said the International Film Festival of India (IFFI) is not a branding exercise for the government or any entity but a platform for paying tribute to creative people. Tewari said the 10-day long festival was just a celebration of the spirit of cinema and humankind. "For the UPA government, who organize this extravaganza every year, it is basically celebrating the spirit of films and humankind. We are doubly committed this year because the festival marks the ending of 100 years and heralds a new century of Indian cinema. "We ensure that we are not branding any activity through the film festival," said Tewari while addressing the media ahead of the 44th edition of the film festival here today. To mark the 100 years of Indian cinema, the government has introduced a centenary award for the film personality of the year. Tewari said the award is permanent one and will be felicitated every year to the artistes, who have given their life for cinema. "It's a tribute to creativity of people, who spent their lifetime to work for the betterment of films. This is permanent award and we will give this every year from now to the apt person," he said. The Minister also shot down reports suggesting this is the last time IFFI is happening in Goa. "Since 2004 the festival is happening here, so, that itself underscores the degree of Goa being the permanent habitat. Goa Government should not be worried about it," Tewari said.